BUCHANAN DAM — Brian Booker of Texas Tournament Zone had his eyes on returning to Lake Buchanan with a major bass fishing tournament the moment the rains started refilling the reservoir. He knew the lake boasted a strong fishery before the drought and felt it would bounce back after the levels rose. The first major bass tournament to return to Lake Buchanan, a TTZ event in May, confirmed Booker’s prediction. 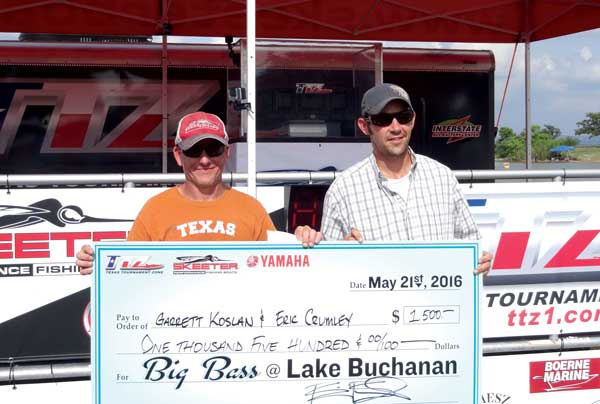 The success of the May tournament earned Lake Buchanan another place on the TTZ schedule. And this one’s the big one: the TTZ Championship. It’s set for Saturday-Sunday, Oct. 15-16. Local businesses are also big winners, and not just during the tournament. Booker said anglers are already hitting the lake to “pre-fish” it in anticipation of the two-day event. While Lake Buchanan lived up to expectations in May, another reason for coming back this month was the incredible enthusiasm from local businesses and the community. The largest bass of the tournament, caught by the team of Eric Crumley and Garrett Kolan, weighed 9.25 pounds. Two other teams hauled in fish weighing 8.85 and 7.62 pounds each. So, the big bass are out there. While the spring tournament was outstanding, Booker expects an even stronger catch in October. Anglers can compete in the championship if they participated in at least three of the five regular tournaments on the TTZ schedule. But Booker said he hopes residents will make the trip to watch the action, which is headquartered at Llano County Park, 3712 Lakeshore Drive in Buchanan Dam. The boats take off around first light, and the flights start returning at about 3 p.m. each day for weigh-in. The weigh-in is an exciting part of the tournament for spectators as they can see the anglers and the bass. Everything is open to the public, Booker said. Go to ttz1.com for more information on the tournament and Texas Tournament Zone.